I’m heading to Los Angeles and Newport / Laguna Beach next Monday! I am super excited for my trip, which I am sure will feel like a whirlwind. While I will be busy with work the majority of the time, I do hope to be able to soak up some of that signature L.A. style. I know that everyone has their own interpretation of style, but more often than not, it seems that design lovers identify certain cities with specific looks. For example, the grand majority of design lovers in Houston opt for a very traditional, French-inspired look with linen, seagrass, and slipcovers. That doesn’t mean that everyone in Houston goes for this look in their home, but it has become rather ubiquitous. 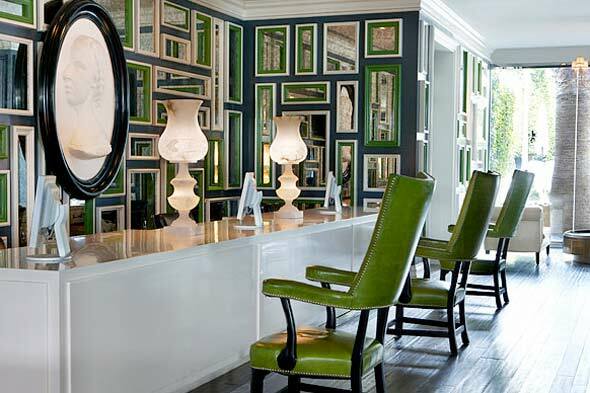 When I think of L.A., I picture glamorous interiors with a touch of Hollywood Regency; bold colors, playful shapes, and modern pieces mixed with vintage touches. Do you have a similar vision of Los Angeles style? How would you describe the style in your city? Enjoy! The weather for you should be fantastic. Laguna Beach is one of my favorite places on earth - welcome! So much pop, fizz and color here in these images -- so quintessentially L.A.
And the weather looks amazing. Have a wonderful and inspiring trip. Ooooo, have fun! Clear-lake-ian here, so I feel you on the flat landscape! 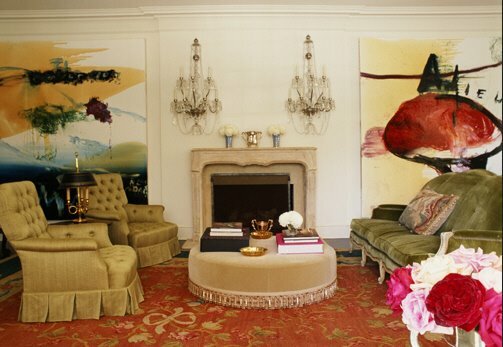 I used the same Peter Dunham image yesterday as a contrast to "typical" Atlanta design in my blog A Curated Lifestyle! As a designer doing California design in the south, I love your post. I love all of these images! It's so interesting to see how decor is defined in different cities. I always equate LA with Hollywood Regency. Have a great trip! This is 100 percent LA! Great photos. You're not even from LA and you've captured the "look" perfectly in these images! hope we can meet up while you're here! If you have any free time and need any advice for the Newport/Laguna Beach area, I am right there and would totally give you places to go or stores that are a must! I am sure you are going to be super busy, but if you have a minute for a fan and fellow blogger... I'd love to buy a Sprinkles Cupcake. You can't come to Newport without having one! I would say your definition of LA style is spot on...but I would add something about the Spanish and Mission influence that perpetuates the architecture all over California. The contrast between traditional lines in this type of architecture and old Hollywood regency is drop dead gorgeous. I LOVE these rooms! 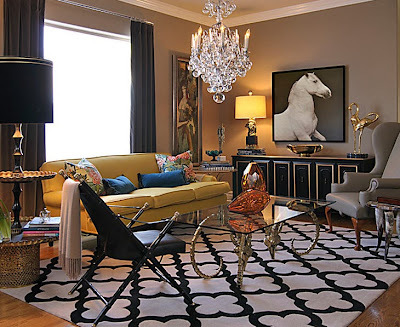 Particularly the black & white quatrefoil rug & the diamond wallpaper. ❤! haven't ever been to the Viceroy, the plate wall is amazing. Have so much fun! Enjoy the weather!